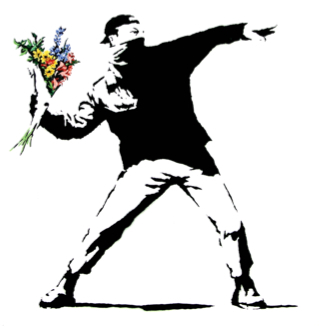 These days my eyeballs have been hungry for anything created by an artist named Banksy. He's probably Britain's best known graffiti artist, and the media tends to lavish him with newspaper features and flattering comparisons to Andy Warhol. But when I was back in Canada no one seemed to have heard of him. Is he worth all the fuss? You can decide by checking out his website here. And for all you Brits for whom Banksy is old news, his work reminds me of a Montreal street artist named Roadsworth, whose art you can check out here.